With the GNOME Volume Manager, featured in most Linux systems with GNOME desktops, getting images from a digital camera can be as easy in Linux as it is in any desktop operating system. With most digital cameras that can be connected to a USB port on your computer, simply plugging the camera into a USB port (with the camera set to send and receive) causes the GNOME Volume Manager to Immediately ask you if you want to download images from your camera. 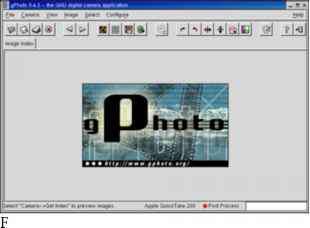 Run the gThumb image viewer and browser program so you can look at, manipulate, and download the contents of your digital camera. Although GNOME Volume Manager opens your camera's contents in an image viewer, you can treat the storage area in your camera much as you would the storage area on a hard disk or a pen drive. I describe how to use your camera to store other data as well. Digital cameras have been around for a while now and offer a genuine alternative to traditional film photography. They store pictures on computer memory cards rather than on film, meaning their images can quickly and easily be downloaded to a PC. You can transfer your pictures from your digital camera to your computer via a direct cable connection into your USB port or by using a card reader. The latter requires buying an extra piece of hardware into which you insert the memory card from the camera so you can download images from it. Note Very nearly all card readers are supported by SUSE Linux. If you find that your camera doesn't work via a direct cable connection, consider buying a card reader. Regardless of whether you're using a digital camera or a card reader, simply attach the device to your computer using the USB cable. In the case of a card reader that's already attached, insert the memory card. Under KDE, you can use Digikam, the default image catalog program, to import your images, or you can simply browse the memory card digital camera in a Konqueror window and copy the pictures manually. When the camera is attached, or a card inserted, you'll be presented with your choices, as shown in Figure 8-21. To use Digikam, select it from the list. To browse the contents of the camera or card in a Konqueror window, click Open in New Window. You could also select Browse with Gwenview, which just lets you view the images on the card, without importing them to your hard disk. If you're using a digital camera, you need to add your camera's hardware profile. Click Camera > Add Camera. In the Configure dialog box, click the Auto-Detect button. This should automatically add your camera to the list of known cameras, so click the OK button. 3. To import photographs, select your camera from the Camera menu. To setup your camera, attach it to your computer and switch it to data transfer mode (if applicable). Then click File Import Photos in gThumb. Then click the icon above the words No Camera Detected. All being well your camera should be automatically detected and you can click oK. if not you can click Choose from the Catalog, and select the model from the list, as shown in Figure 3.17. The Port dropdown should then be filled in automatically, but you should inspect it to make sure. Clicking OK will then cause gThumb to probe the camera and import thumbnails, which you can then download. To make gThumb start automatically when you connect a USB camera, click System Preferences Removable Drives and Media. Then, in the Command text box under the Digital Camera heading, replace f-spot-import with gthumb --import-photos. 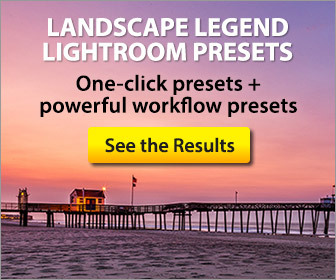 Digital photography is displacing traditional film photography for many applications. You can buy a digital camera for anywhere from around 50 to well over 1000, depending on your needs. You can then download images from the camera to your computer, manipulate them in a graphics editor, and print the results to a high-resolution color printer. Many drug stores and malls now feature digital photography kiosks for even higher-quality prints, too. Unfortunately, most digital cameras ship only with Windows and Mac OS software, so to take advantage of these devices from Linux you need to locate an appropriate package. Fortunately, the Linux gPhoto program (http gphoto.sourceforge.net) does an excellent job supporting a wide variety of cameras. The following procedure describes how to download images from your digital camera. 1. Using a cable provided with your digital camera, connect your camera to the USB or COM port on your computer. (I had better luck with the USB port.) 2. Set your camera to be in Send and Receive mode. 3. From the main Red Hat desktop menu, choose Graphics Digital Camera Tool. The gtkam window appears. 5. Click the down arrow next to the Model box, select your camera, and click Detect. 6. Click Apply, then OK. Your camera model should be listed in the gtkam window. 7. To begin downloading images from your digital camera, click the camera name that appears in the left column, and then select the folder containing the images from that camera. After the images download (which can take a while), thumbnails appear in the main gtkam window, as shown in Figure 8-8. Figure 8-8 Download images from digital cameras from the gtkam window. Figure 8-8 Download images from digital cameras from the gtkam window. Now whenever you connect a digital camera to your computer GNOME will automatically detect it (see Figure 11.3), and ask whether you want to import the photographs. Figure 11.3. GNOME detects the presence of a digital camera and asks whether the photos should be imported. Figure 11.3. GNOME detects the presence of a digital camera and asks whether the photos should be imported. The next two sections discuss the primary applications that Ubuntu and Kubuntu provide for working with your digital camera, namely F-Spot and DigiKam. These applications were introduced in the Photo Editing Overview section of Chapter 18 (which also lists some alternate digital camera-related applications that are available for Ubuntu and Kubuntu), but the following sections focus on F-Spot and DigiKam in detail. If your camera is supported by gPhoto2 and you prefer to access your photos directly from your camera rather than fiddle with flash storage cards (or if you're just not sure whether your camera is supported or not), connect the USB cord supplied with your camera to the camera itself and then to one of the USB ports on your computer. Once you've done that, turn the camera on, and set it to communicate with your computer. Switching the camera to Play mode, rather than Camera mode, usually seems to do the trick, but you should check your owner's manual just to be sure. If your camera is supported by gPhoto2, and the chances of that are quite good, a small window will appear, as shown in Figure 14-1. To view the images on your camera, click the Import Photos button. Figure 14-1 Your system seeks your approval before importing photos from your digital camera. To import photographs into F-Spot from a digital camera 3. Click the camera as the source for the photographs. The Select Photos to Copy From Camera dialogue box opens, which lists all the photos in the camera. Select the photos you want to import and click Copy. Figure 8.22 Selecting Images to Copy 4. F-Spot copies the photographs to the specified location and displays the copied photographs in the right pane of the F-Spot window. Figure 8.22 Selecting Images to Copy 4. 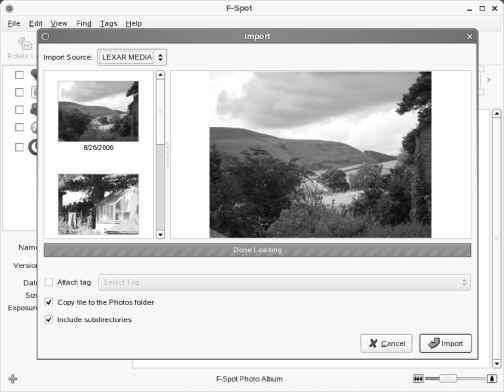 F-Spot copies the photographs to the specified location and displays the copied photographs in the right pane of the F-Spot window. Once your LAMP server is operational, you can begin installing or creating applications to run on it. One such application is Coppermine Photo Gallery (CPG), the installation of which is demonstrated in this section. CPG is a Web-based photo gallery management system written in PHP Through its Web interface, you can upload pictures to your own photo galleries, which will be available on the Web through your LAMP server. With the gtkam window, you can download and work with images from digital cameras. The gtkam window is front end to gPhoto2, which provides support for dozens of digital cameras in Linux. The gtkam window works by attaching a supported digital camera to a serial or USB port on your computer. You can view thumbnails of the digital images from the camera, view full-size images, and download the ones you select from the camera to your hard disk. Check the gPhoto2 Web site for information on supported cameras as well as other topics related to gPhoto. Here is a list of currently supported digital cameras. Most digital cameras can connect to the Universal Serial Bus (USB) port. If you have such a camera, you can access its storage media (compact flash card, for example) as a USB mass storage device, provided your camera supports USB Mass Storage. To access the images on your USB digital camera, use the following steps 2. Connect your digital camera to the USB port by using the cable that came with the camera, and then turn on the camera. This causes the Linux hotplug system to detect the camera and mount it the media usbdisk directory on the Linux file system. There are programs to handle many hand-held digital cameras which will run Linux. Cameras that support compact flash or floppy disk storage of standard JPEG images should also work using those media to transfer the image data. A new application called gPhoto (http gphoto.fix.no gphoto ) supports about ten different brands of digital cameras. Some digital cameras may also be supported under the SANE library. The PC has become an increasingly useful tool in the field of photography. 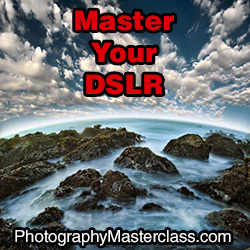 In fact, these days it's hard to find a professional photographer who doesn't use a computer in some way, either to download digital camera images or to scan in images taken using traditional film-based cameras. In an increasingly connected world, you will find yourself plugging all sorts of devices and widgets into your computer. For the most part, it is usually multimedia files that you want to launch in a specific way. Ubuntu provides a great tool to configure the consequences of everything from plugging a digital camera into your computer, inserting a film DVD, and even plugging in a graphics tablet. For example, in Figure 2.11, you can see the options for handling digital images in Ubuntu. Rather than using gthumb to import pictures from a digital camera, I want Ubuntu to use F-Spot, a cool photo management and editing application available through synaptic. In this case, I need to enter the f-spot command in the Command field and make sure to check mark the Import Digital Photos When Connected option. Now when I connect my digital camera after a hard day's snapping, GNOME will detect its presence and launch F-Spot, ready for it to import my pictures directly into its library. The Universal Serial Bus (USB) specification was designed to allow PCs to support more peripheral devices without adding serial or parallel connections to an already overburdened pile of cables. It also allows devices that don't need a permanent connection to the PC (such as digital cameras and audio players) to plug in and Among the types of devices you'll see that plug into a USB port are keyboards, mice, modems, scanners, printers, digital cameras, webcams, and network cards (both wired and wireless). Removable media such as CDs and DVDs, USB storage disks, digital cameras, and floppy disks will be displayed as icons on your desktop. These icons will not appear until you place the media into their appropriate devices. To open a disk, double-click its icon to display a file manager window and the files on it. Ubuntu now supports removable devices and media such as digital cameras, PDAs, card readers, and even USB printers. These devices are handled automatically with an appropriate device interface set up on the fly when needed. Such hotplugged devices are identified, and where appropriate, their icons will appear in the file manager window. For example, when you connect a USB drive to your system, it will be detected and displayed as a storage device with its own file system. Removable media such as CD and DVD discs, USB storage disks, digital cameras, and floppy disks will be displayed as icons on your desktop. These icons will not appear until you place the disks into their devices. To open a disk, double-click it to display a file manager window and the files on it. From Big Board, you consolidate icons and menus to connect to your online photo services (like Flickr), retail accounts (such as Amazon), movie rentals (such as Netflix), and others. It also, however, keeps track of the files and applications you use locally. Flickr Visit your online digital image collection at Flickr.com. Tiny Icons The tiny icons below the User Information represent the online services you have configured for your Mugshot account. Beginning with the top-left icon in this example, the icons represent Digg, Picasa, Amazon, Netflix, Del.icio.us, my home URL, Reddit, Twitter, and Flickr. Tools for creating and manipulating graphics are becoming both more plentiful and more powerful in Linux systems as a whole. Leading the list is the GNU Image Manipulation Program (GIMP). GIMP enables you to compose and author images as well as retouch photographs. To work with vector graphics (where geometric shapes represent images, instead of just dots), Inkscape is a popular open source application. Other tools for creating graphics include ksnap-shot (a program for taking screen captures) and kpaint (for working with bitmap images). 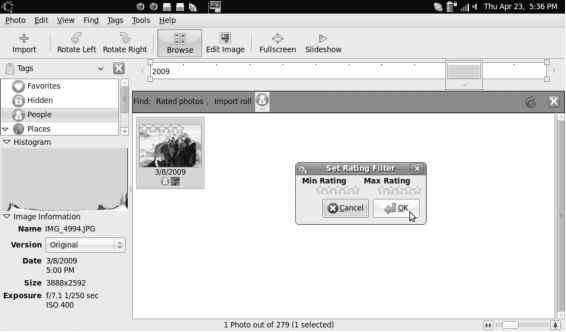 The GIMP is a free software program for manipulating photographs and graphical images. To create images with GIMP, you can either import a drawing, photograph, or 3D image, or you can create one from scratch. You can start GIMP from the system menu by selecting Graphics C GIMP Image Editor or by typing gimp& from a Terminal window. 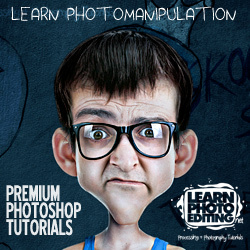 GIMP is a free software program for manipulating photographs and graphical images. To create images with GIMP, you can either import a drawing, photograph, or 3D image, or you can create one from scratch. You can start GIMP from the system menu by selecting Graphics O The GIMP or by typing gimp& from a Terminal window. Think of a typical office computer and you're likely to imagine a system that runs certain types of programs, such as word processors and spreadsheets. A prototypical desktop office system has a monitor, a keyboard, and a mouse for human interaction, and it is connected to a printer for output. One component is missing from this stereotypical office desktop computer, though a scanner. Not every computer has or needs a scanner however, for many applications, scanners are indispensable. With a scanner, you can load printed photographs into files you can manipulate with graphics programs, convert textual documents into word processing files, and even (with the help of a printer and a modem) turn a computer into a photocopier and fax machine. When I talk about images and graphics, I mean applications that are meant to work with photographs or other images and those that enable you to prepare vector drawings drawings consisting of lines and shapes for use in various types of documents. SUSE Linux includes a number of such image and graphics applications. You can find these applications in the Main MenuO Graphics menu. Digital camera interface Digital camera interface Digital camera interface is for connecting a digital camera to the SUSE Linux system and downloading the photos from the camera. If the digital camera application does not support your digital camera, you can usually access it as a USB storage device after you connect the camera to the PC's USB port using the cable supplied with the camera. Over a very short space of time, digital cameras and digital imagery have become extremely popular, to the point where some traditional film camera manufacturers are switching solely to digital. This meteoric rise has led to an increase in the number of applications that can handle digital imagery. Linux, thanks to its rapid pace of development, is now highly regarded as a multimedia platform of choice for editing digital images. Konqueror generates the thumbnails and adds them to the thumbs directory. The image gallery page itself opens and is saved to the images.html file. (Select the Folders button to save the gallery under a different name. You can also have Konqueror create galleries in recursive subfolders to a depth you choose.) You can now copy the entire contents of this directory to a Web server and publish your pictures on the Internet. Here's an example of a Konqueror image gallery. Conceptually different from the Microsoft version, HAL provides a constantly updated list of detected components. Ubuntu Linux can even automatically detect and mount the smart cards associated with digital cameras and fingerprint readers. Fedora Core comes with a whole lot of applications. All you have to do is look at the menus in GNOME or KDE and you'll see what I mean. Often, there is more than one application of each type. Both GNOME and KDE come with the OpenOffice.org office application suite with a word processor, spreadsheet, presentation software, and more. You find many choices for CD players and multimedia players, not to mention the games, utility programs, and useful tools, such as a scanner and digital camera applications. If you own a Bluetooth-equipped camera phone, you might be used to transferring pictures to your computer using Bluetooth. It's by far the easiest way of getting pictures off the phone and avoids the need for USB cables or card readers. To transfer files via Bluetooth, you can use the Bluetooth applet. To access a USB drive, connect the USB drive to any USB port. The drive will be automatically detected and a file manager window will open showing the contents of the drive. You can read, copy, move, and delete files on the USB drive. A USB drive icon will appear on the desktop. Moving the cursor over the icon displays detailed information about the drive, such as where it is mounted and how much memory is used. Right-clicking and choosing Properties will display tabs for General, Permissions, Meta Info (space used), and Mounting information. The USB drive menu also has an entry for transferring an image file to the digiKam tool (Download Photos With digiKam). To remove a USB drive, right-click the USB icon and choose Safely Remove. The USB drive icon will disappear from the desktop, and you can then remove the drive. The type of data you're storing will determine the type of backup plan you need. When this is personal data, such as letters or photographs, then consider a NAS featuring built-in RAID functionality. These often autoconfigure themselves when a second drive is plugged in, so be warned if you insert a used drive thinking you'll gain extra space Several types of RAID configuration are available, but the most common in this case is RAID-1, which uses a second drive to make identical copies of anything written to the first. It does this automatically and transparently from the user, so should either drive fail, the other can be used to recover the data. You should always remember, however, that RAID isn't a backup It just makes it a bit less likely that you'll lose data to disk failure. It won't protect against corruption from controller failures, fire, flood, or theft. The GIMP program is a free software program that comes with Red Hat Linux for manipulating photographs and graphical images. To create images with GIMP, you can either import a drawing, photograph, or 3D-image, or you can create one from scratch. You can start GIMP from the system menu by clicking on Graphics The GIMP or by typing gimp& from a Terminal window. Fill Screen This option forces the picture to fit the screen, including squashing or expanding it if necessary (known as altering its aspect ratio). If the wallpaper isn't in the same ratio as the screen, it will look distorted. Most digital camera shots should be okay, because they use the same 4 3 ratio as most monitors (although if you have a widescreen monitor, a digital camera picture will be stretched horizontally). One of the big selling points of these devices is that they can be moved from room to room, and even from house to house, without requiring a network. This makes it much easier to show your photographs and home videos to the ungeeked members of your family and friends because you can simply plug a media-enabled NAS device into any TV, and it will work. It is also a way of introducing (a small level) of control over what the kids are able to watch, because they'll be limited to the contents of the hardware. Fill Screen This option forces the picture to fit the screen, including squashing or expanding it if necessary (known as altering its aspect ratio). If the wallpaper isn't in the same ratio as the screen, it will look distorted, as shown in Figure 10-3. Most digital camera shots should be okay, because they use the same 4 3 ratio as most monitors (although if you have a widescreen monitor, a digital camera picture will be stretched horizontally). Users can choose their own login pictures by clicking System > Preferences > About Me. The About Me dialog box is designed for users to enter their personal details, such as their addresses, but they can also simply use it to choose photographs of themselves, or to simply add pictorial icons. To do this, click the empty square alongside your name at the top of the dialog box. You'll be shown a file list of default icons, or you can navigate to your own. Ideally, the image you choose should be square and 96x96 pixels, although if the picture is too large, it will be automatically scaled down. Click OK when you've finished. When you insert a removable medium (CD or DVD) or plug in a removable device (digital camera or USB flash drive) from a KDE desktop in SUSE, a window opens to let you choose the type of action to take on it. If you want to add a different action, or change an existing action, click the Configure button. File systems are organized differently in Linux than they are in Microsoft Windows operating systems. Instead of drive letters (for example, A , B , C ) for each local disk, network file system, CD-ROM, or other type of storage medium, everything fits neatly into the directory structure. For hard drive partitions, it is up to an administrator to create a mount point in the file system and then connect the disk to that point in the file system. For removable media (such as CD, DVD, USB flash drives, or digital cameras), mount points are automatically created and connected (in the media directory) when those items are connected or loaded. Several free and commercial packages make it easy to repartition an existing disk drive. In 99 times out of 100, repartitioning an existing disk drive is completely safe and will not damage or lose any of the existing programs or data on your Windows partition. However, preventing the pain associated with that one remaining time is worth the effort that it takes to back up your important data before making any changes to your disk partitions. If you're tempted to skip this step and just go ahead with repartitioning, stop and think for a moment what it would be like if you lost your computer system or it was destroyed. None of the saved e-mail that you've exchanged with friends and family, none of those letters you've written, none of your digital photographs, none of your music collection, the great American novel all gone. Are you really willing to take that chance If so, you're braver than I am. While many of the other programs introduced so far mirror the Windows look and feel in some way, The GIMP walks a different path. It has its own unique way of working, which takes a little getting used to. 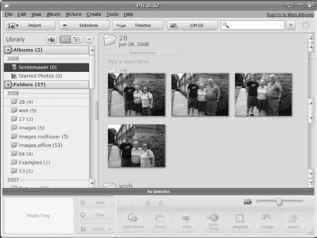 But it's very much worth the effort, because The GIMP offers photo-editing tools on par with professional products like Adobe Photoshop. It's certainly more than powerful enough for tweaking digital camera snapshots. Now that we have seen several aspects of the file system from an end user's perspective, we will look at some of the administrative aspects of the file system such as the different drives on a system and its partitions. Apart from the hard disks on a system, there is almost always a floppy disk drive and a CD-ROM drive, both of which are treated as file system drives. In addition, certain other peripheral devices such as digital cameras or removable storage devices may present the storage available on them as file system drives. A drive may be mounted - that is, made available for use by the file system. The drive may also be unmounted, making it unavailable for the file system to use. You can change the icon for any file or folder to whatever you want. Right-click the file or folder, click Properties, and then click the Select Custom Icon option. You can choose from a wide range of supplied icons or click the Browse button and locate your own graphic. 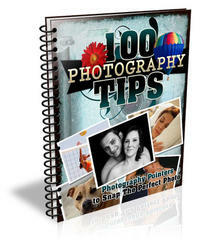 Virtually any image can be used, regardless of format or even size, so you can use digital camera snapshots if you wish. Choose a picture and then load it into the GIMP (right-click and select Open With Open with GIMP Image Editor) you might like to know that the default Ubuntu desktop wallpapers are stored in usr share backgrounds. You should select a picture that's roughly in 4 3 ratio, such as a digital camera snap. Don't select very tall or broad images they won't work. These tools are new additions to The GIMP that allow you to create further effects with your images. The dodge and burn tool is for adjusting the brightness or shade, and is especially useful for working with over- or under-exposed photographs. Switch between dodging and burning with the Options menu. The section of Chapter 19 on Setting CD and DVD Preferences explained how to configure your system's behavior when a blank, audio, or data CD or DVD is inserted. CDs and DVDs may be the type of removable media that you'll use most frequently with your computer system, but consumer electronics (CE) devices are probably a close second. The following sections discuss how to configure how your system handles digital cameras, PDAs, digital audio players, and so on. (How your system interacts with removable media such as flash drives (USB sticks) and external drives is discussed in detail in Chapter 24, Adding Hardware and Attaching Peripherals.) The next two sections focus on what your system does when you attach various types of consumer electronics devices to your Ubuntu or Kubuntu system, and how you can configure your system's behavior. Digital devices such as music players, digital cameras, mobile Internet devices, and smart phones are a key element of today's culture. Though these devices are designed to work in isolation, they almost always require some sort of connection to a desktop or laptop to synchronize, update, or archive content. Each type of device has its own connection requirements. For digital music players, such as iPods and MP3 players, connecting to a laptop or desktop system enables you to synchronize libraries and playlists or simply to add new music. For digital cameras, you are usually downloading and archiving photos to free up space on the device. For smart phones and PDAs, you're usually synchronizing address books and archiving notes and other content. As you might expect, different versions of Kubuntu behave differently when consumer electronics devices are attached, because they are based on different versions of KDE, with different default behaviors and customization opportunities. The next two sections discuss how KDE 3-based Kubuntu systems (Kubuntu 8.04 and earlier) and KDE 4-based systems (Kubuntu 8.10 and later) behave by default when digital device such as music players and digital cameras are attached, and the extent to which you can customize that behavior. KDE 3-based systems such as Kubuntu 8.04. KDE 4 takes a simple and straightforward approach when digital devices are attached to your system, popping up a dialog that identifies the type of the device and provides a best guess of the type of content that it contains. Figure 21-8 shows two examples of this pop-up dialog, the one on the left for a digital music device, and the one on the right for a digital camera. As you can see from the image on the right, moving the mouse over the entry for a device displays an Open in Dolphin message to mount that device and open it in the Dolphin file manager, simply left-click on the name of the device. The dialog at the left in Figure 21-7 shows the default menu that displays when you attach a digital audio player to a Kubuntu 8.04 or earlier system, while the dialog at the right in Figure 21-7 shows the default menu that displays when you attach a digital camera to a Kubuntu 8.04 or earlier system. These dialogs differ only in the icon that they contain otherwise, they're the same, which is somewhat disappointing, since they seem to think that all the world's a camera, and therefore don't provide an option for automatically starting Amarok to interact with a digital audio player. Luckily, the KDE 3 desktop environment used on Kubuntu 8.04 and earlier systems makes it easy to add new options to the dialogs that it displays when new devices are attached. Some people prefer to protect their private data in public, by using services such as Flickr, Google Docs, and YouTube. The situation is the same as earlier with the exception that, being free services, there are fewer warranties about loss of data. Indeed, Google Mail has a personal storage limit of just over 7GB, which allows you to back up your data by saving them as attachments in your mail account Or by using gmailfs. The holiday season ended about a month ago as I write this, and I brought home hundreds of digital photos of family and friends. Most of these photos were taken indoors, so some of them have all kinds of lighting problems (I refuse to acknowledge that for many of them I forgot to turn on the flash). I also have a really cute photo of my nieces and nephews playing together, but unfortunately all of them have glowing red eyes, seriously reducing the cuteness factor. My camera has a red-eye reduction setting, but it's a pain to turn on and off, and it really drains the battery. One of the simplest imaging tasks is that of recording a still image. There are two classes of programs for doing this those that download images that have already been captured by portable digital cameras and those that capture an image from a WebCam or video capture card. Using gPhoto with a Digital Camera gPhoto (http www.gphoto.org) is the most advanced Linux tool for interfacing to a portable digital camera. This program, which is shown in Figure 13.7, is still in beta test in early 2000, but is nonetheless usable, even with USB-interfaced cameras. gPhoto can acquire thumbnail images from a digital camera, allowing you to select which images you want to download. gPhoto can acquire thumbnail images from a digital camera, allowing you to select which images you want to download. Because many devices holding multimedia content are removable (CDs, DVDs, digital cameras, Webcams, and so on), recent features in Linux to automatically handle removable hardware and media have greatly improved the Linux desktop experience. See the section on managing hardware in Chapter 4 for descriptions of how features such as Udev and HAL are used to manage removable media. The first step when editing most images is to correct the brightness, contrast, and color saturation. This helps overcome some of the deficiencies that are commonly found in digital photographs or scanned-in images. To do this, right-click the image and select Colors. You'll find a variety of options to let you tweak the image, allowing you a lot of control over the process. If you have hundreds or even thousands of digital photos stored on your hard drive, it can take quite some time to locate a specific photo. Even if you've titled your photos (such as birthday154.jpg), you still have to open them to see exactly who or what they display, or scan through thumbnails of all your photos looking (squinting, actually) for that one specific photo. It's a hassle, but Picasa offers a much better method. The goal of the GNOME Online Desktop is to provide a desktop suitable for running applications directly from the Web and storing information online. This allows the desktop to be the window to applications like Facebook, Gmail, Flickr, Netflix, and other online services. Figure 18-1 shows an example of the Online Desktop. After importing the photographs, you can categorise and tag them as you would to create a playlist in a music player. 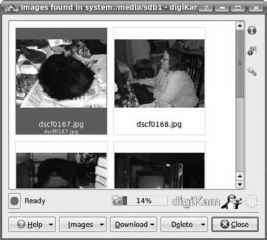 Importing Photographs from the Hard Disk To import photographs into F-Spot from the hard disk of your computer 3. In the Import Source box, the Select Folder option is selected by default. Retain the option, navigate to the folder that contains the photographs and click Open. Most scanners work by reflecting light off of an object and detecting the reflected light with a charge-coupled device (CCD). Stated this broadly, scanners are no different from digital cameras. In practice, scanners usually take longer to form an image because their CCDs can't take in the entire image at once. Instead, the scanner builds up the image as its CCD views one part of the page after another. Precisely how the scanner shifts its point of view varies from one device to another. These variations form the basis of the major classifications of scanners. The kernel boots rather quickly, even with no attempts to make it go faster. In the example later in this chapter, an unmodified kernel for a 400Mhz arm board boots in about seven seconds from power-up, and three of those seconds are spent by the boot loader waiting for the user to interrupt the boot process (the measurement was done on a device still used for development). This means the device is ready to run user programs in about four seconds. This also means speeding up the kernel boot process is a series of changes that reduce the speed in the quarter- to half-second range with effort, you can reduce the time to about two or three seconds, which is in the range of a digital camera. When it comes to multimedia, Ubuntu is definitely no slacker. In fact, the Ubuntu Studio edition is absolutely brimming with programs for handling all types of multimedia. But you don't need to install Ubuntu Studio to be able to retouch and print photographs, edit home movies, or play your MP3s, because the standard Ubuntu edition comes with programs for these tasks, either preinstalled or available for download and installation with a few mouse clicks. DestroyFlickr manages your on-line Flickr account. Figure 2. DestroyFlickr manages your on-line Flickr account. DestroyFlickr is a program that lets you manage your Flickr stream with an interface that resembles a light table. It's a convenient way to use Flickr. Another application that currently works under Linux is Flump. It is much more simplistic in its interface, but it can upload and download photos. Figure 3. Flump is a very simple Flickr app. Figure 3. Flump is a very simple Flickr app. FotoBooth is an application written in Flex that allows you to take photos with your Webcam. It supplies real-time effects you can apply to the photos and allows for uploading directly to Flickr. Figure 13. FotoBooth is a clone of Apple's PhotoBooth, with Flickr integration. Figure 13. FotoBooth is a clone of Apple's PhotoBooth, with Flickr integration.